Rocky 5 and the early 1990s. 90s rap and hip hop. Joey Ellis – Go for It (Heart and Fire). Urban Blight. Back to America. Real retirement. Reconnecting with Rocky’s roots. But actually, this time. The lazy route the film could have gone. How the fifth film betrays the formula. The last Rocky movie isn’t the last one. The dark side of the ring. Redemption sequel. The third wave of Double Feature’s asian films and asian extreme. Camp and style in The Machine Girl. How Kill Bill paid off. Hattori Hanzo, all over the goddamn place. The ambiguity of references and inspiration. Deep fried arm. The blood soaked lens. Absurdist cartoon violence? The commonality of America’s favorite asian horror films. Burst of violence. The grotesque in The Machine Girl. Japan and strange weapons. 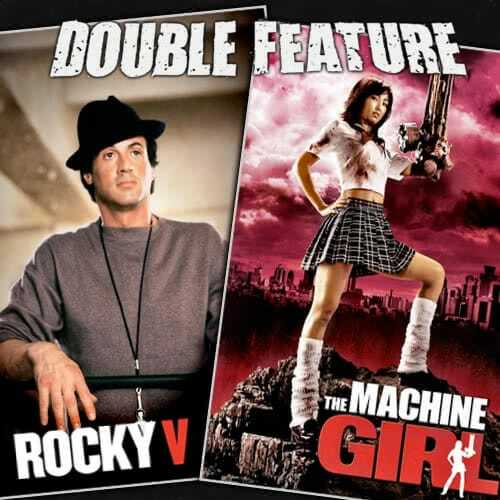 This entry was posted in All Podcasts, Rocky + Asia, Year 4 and tagged John G. Avildsen. Bookmark the permalink.